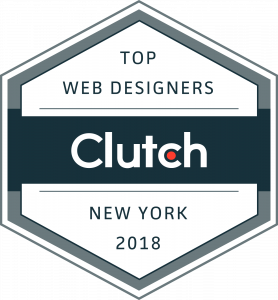 Recently, Clutch released their annual report of the top-performing agencies and developers in New York. Clutch analysts identified 204 companies that provide the best creative, design, and development services. Each company on the report was evaluated and ranked based on market presence, work quality, services offered and verified client feedback. We are proud to announce that when it comes to web development, StatenWeb has one of the top PHP developers in New York. Located in the nation’s capital, Clutch is a B2B ratings and reviews platform that conducts market research on agencies, software, and consultants in the IT industry. Clutch connects small and medium businesses with the best-fit companies they need to tackle challenges together and with confidence. With over 7,000 firms listed on the ratings platform, Clutch uses a unique rating methodology that compares these companies based on in-depth client feedback. Clutch displays its research using a Leader’s Matrix, a 2×2 matrix where service providers are mapped based on their areas of focus and their proven ability to deliver. 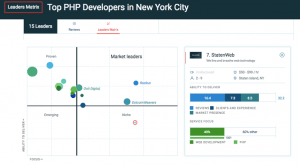 Take a look below to see StatenWeb listed in the top 10 PHP development companies in the city! We would like to thank our incredible clients that took the time to review us on Clutch. 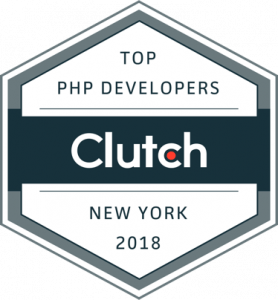 Thanks to their honest feedback, Clutch analysts identified us as a company that delivers when it comes to our development services. As many of you know, our main goal is to develop user friendly websites and make lasting relationships with our clients. I think you can see that dedication if you browse through our Clutch reviews! To learn more about our five-star rated services, make sure to contact us for more information!